You may be one of the many homeowners who have to deal with low ceilings from day-to-day within your home. This may be out of choice or out of necessity, but the fact remains that you are deprived of the aesthetics that are implied with high ceilings. There are numerous homeowners in Pakistan who are paying the price of hiring an unprofessional contractor or builder. The good news is that the best interior designers in Lahore have been using different design hacks to create fake high interiors for years. To aid you in resolving this issue, here we have shared a few practical solutions that will create the illusion of high ceilings. Design trick is the key to making your ceilings appear higher. An ideal way to achieve this is by creating vertical stripes on your walls because they draw eyes upwards. In fact, this trick particularly points visitors’ spectacle towards the right direction. To add a luxurious touch to any room, drum shade lighting or chandelier may be an obvious choice. However, these two lighting fixtures can also work as culprit to bring down the ceiling height. That’s why best construction companies in Pakistan recommend their clients to stick to recessed or mounted light fixtures. Furniture that sits close to your floor avoids making your space appear cramped or closed in. This makes sense since low-profile furniture takes up less space and makes the distance between your ceiling and furniture greater. Reflective surfaces are the ultimate choice when you wish to give the impression of a bigger space. This holds true especially when mirrors are installed a tad higher than usual. It helps a great deal when you seek an expansive look. If you are privileged enough to have such an amenity in your room, make sure you take full advantage of it. The finish around your fireplace should ideally go all the way up to the ceiling. Not only will this give your room a focal point, but it will also make it appear bigger. Custom details on ceiling borders help you enhance the look of any room. Most of all, they draw the gaze upwards and make the ceiling look taller than it actually is. A fresh coat of paint or using a striking wallpaper can make your guests stare at the ceilings without even blinking. 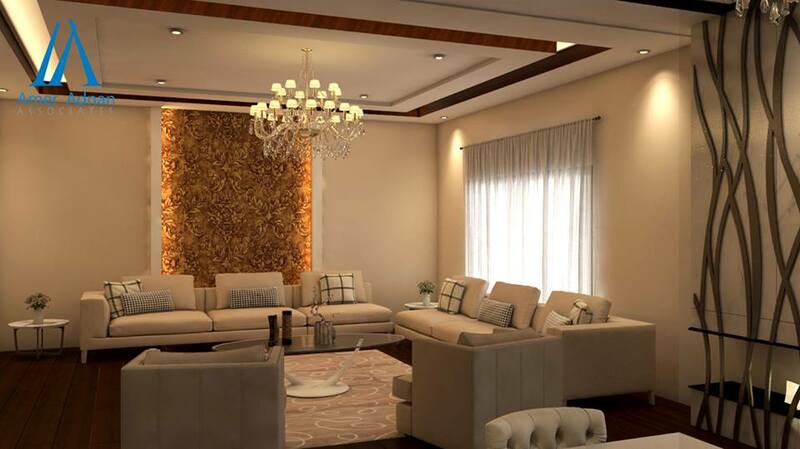 A professional interior designer in Pakistan would suggest that you use a high gloss paint as its reflection will make the ceiling appear taller.